A weekend in Niagara Falls makes for a perfect winter getaway. With spectacular sights, one-of-a-kind attractions, and countless shops, hotels and restaurants, there’s no better place to spend a weekend away from home with friends and family. Take a walk to the brink of the Falls near the Table Rock Welcome Centre and see the rushing waters from up close. Spend some time taking in the most powerful waterfall in North America and one of the most famous waterfalls in the world, because it’s a truly breathtaking sight. 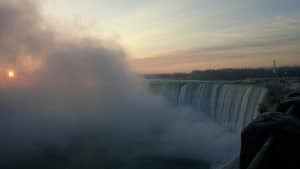 Visit Niagara Parks’ Journey Behind the Falls and experience the incredible power of the Horseshoe Falls from both behind and below. If you’re on a family weekend getaway, you can escape the cold and have a full day of fun at the Fallsview Indoor Waterpark. With 16 thrilling waterslides, a giant indoor wavepool, 1,000 gallon tipping bucket and more, it’s a one-of-a-kind destination that offers fun for people of all ages. Stop by Niagara Brewing Company on Clifton Hill from 3-4pm and 7-8pm for daily “Hoppy Hour” drink specials and on Thursdays for Thirsty Thursday food and drink specials from 6pm-12am. With live entertainment, amazing food, innovative and delicious craft beer, and a beer store where you can buy your favourite brews to take home, it’s a great place to sit back and have a relaxing time with friends. Experience delicious farm-to-table cuisine at Windows by Jamie Kennedy Fresh Grill & Wine Bar. The seasonal menu showcases the very best local ingredients from throughout the Niagara Region, and the view of Niagara Falls from the dining room’s floor-to-ceiling windows is breathtaking and unforgettable. Until January 31st you can check out the annual Winter Festival of Lights in Queen Victoria Park, Dufferin Islands, and around the city’s tourist district as millions of sparkling lights and wonderful light displays light up the city. You can also catch a spectacular fireworks show over Niagara Falls on Fridays at 9pm. Stay in a spectacular Fallsview guestroom at one of the city’s many amazing hotels like the Sheraton on the Falls or Crowne Plaza Niagara Falls-Fallsview, and experience world-class accommodation right in the heart of the city. There is no shortage of sights to see and fun to be had in Niagara Falls, so start planning your weekend winter getaway today and find out for yourself what makes Niagara Falls a favourite destination for millions of visitors each year.